December 21, 2013 - A quarter of a century has passed since the tragic events of December 21, 1988. But to some, it seems like only yesterday that Pan Am Flight 103 exploded over Lockerbie, Scotland, killing all 259 people on board—including 189 Americans and 11 Scots on the ground. Today, as in years past, the victims were honored during a ceremony at Arlington National Cemetery’s Lockerbie Cairn a memorial built of 270 blocks of red Scottish sandstone, each representing a life that was lost in the disaster. Friends and family members of the victims were joined by investigators and other officials with ties to the case to remember their loved ones and reflect on that unforgettable day. Among the attendees was former FBI Director Robert Mueller, who led the investigation into the attack when he was an assistant attorney general at the Department of Justice. The passage of time has not healed all wounds inflicted by this disaster, and this day will forever serve as a solemn reminder that the fight against terrorism is an unending one. The FBI remains committed to that fight. 25 years ago, on a cold and ultimately chilling evening just four days before Christmas, Pan Am Flight 103 took off from London's Heathrow Airport bound for New York City. Among the 259 passengers and crew were 189 Americans. They never made it home. 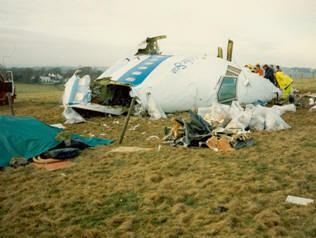 Less than 40 minutes into the flight, the plane exploded over the sky above Lockerbie, Scotland, killing everyone on board and 11 Scots on the ground. Until 9/11, it was one of the world’s most lethal acts of air terrorism and one of the largest and most complex acts of international terrorism ever investigated by the FBI. Solving the case required unprecedented international cooperation and hours upon hours of painstaking work. With the mid-air explosion 30,000 feet up, debris rained down over 845 square miles across Scotland. FBI agents and international investigators combed the countryside on hands and knees looking for clues in virtually every blade of grass, eventually turning up thousands of pieces of evidence. They also traversed the globe, interviewing more than 10,000 individuals in dozens of countries. Participating in the investigation were an array of international police organizations from such countries as Germany, Austria, Switzerland, and, of course, Great Britain (including Scotland). "The constables in charge of the Scottish end of the investigation had constructed a small wooden warehouse in which were stored the various effects of those who were on the plane when it broke apart in the skies: a white sneaker never again to be worn by the teenager; a Syracuse sweatshirt never again to be worn by the Syracuse student, and other such everyday pieces of clothing and personal belongings. These ordinary items brought home to me, and came to symbolize for me, the pain and the loss felt by those whose family, friends, or colleagues died that evening." It is that loss that we remember and honor today. And it is horrific cases such as these that strengthen the FBI's resolve to help prevent acts of terrorism in the future.